The Nimbo Posterior Safety Roller is designed for children with Neurological Impairments, Orthopedic and Developmental Disorders. It supports the child from behind, promoting an upright posture and trunk extension. The Nimbo offers your child the opportunity to freely move around in a safe, yet roomy environment. It eliminates bumps and bruises due to accidental falls and collisions. Children with physical impairments, brain injury, cerebral palsy, spina bifida and other conditions that affect their ability to walk, will enjoy their ability to now keep up with friends while playing. Support weights up to 200 lbs. The Nimbo Posterior Safety Roller comes in four styles, colors and sizes (see chart below). The Tyke Goldenrod Yellow 15" - 18.5" 13.75" 9 lbs. 100 lbs. Junior Lime Green 19" - 25" 14" 10 lbs. 100 lbs. Youth Cornflower Blue 23.5" - 31.5" 15.75" 11.5 lbs. 200 lbs. Young Adult Midnight Blue 28" - 36" 16.5" 14 lbs. 200 lbs. SIZE: To determine the right size and height for your child, measure your child from the wrist to the floor. Accessories available for your Nimbo Posterior Safety Roller include the Pelvic Stabilizer and Forearm Platform with Mounting Brackets ( shown on the right and sold separately). If you have questions, please call - 1.888.833.8875. Our customer service representatives are available to assist you Monday through Friday from 9:00 a.m. to 5:00 p.m., EST. The Nimbo Pelvic Stabilizer helps children with an asymmetrical posture while standing or walking stay centered when using the Nimbo Posterior Safety Rollers. 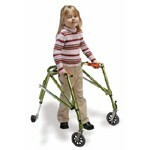 The Out/Stander has three positioning levels: Prone, Upright, and Supine, and is designed for use by children with lower extremity, neurological, or walking disabilities. Children with moderate to severe physical and neurological disabilities can improve and maintain proper body alignment with the MSS Tilt & Recline Positioning Seat. It tilts up to 45 degrees and the back reclines from 80 to 140 degrees.